…At Broughton Lane’s own fish bar, better known as Melville’s, just off Lord Street, Salford. Nestled amongst uniformly built new properties and given where I’m from in Birmingham – in the middle of nowhere. Blame my temperamental phone for not being able to take a genuine picture plus the people there would have looked at me quite strangely. Hunger may have been the driving force, or my reluctance to dine alone on Friday night in a busy Manchester restaurant, but ultimately, nobody can resist an offer when it’s packaged so temptingly: £3.50 Fresh Fish and Chips with Tea/Coffee or Cold Drink. Nothing had travelled my oesphogus all day – I was theirs. 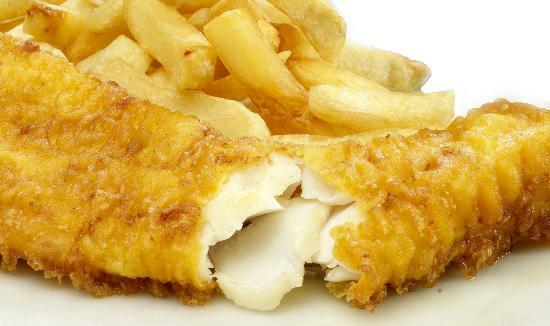 Dunked in smooth, creamy batter, a small fillet straight from the fridge drawer was dropped into boiling oil, but unlike the half-dead slimy stuff that usually coats my Cod at home, this batter was a crispy, golden suit of armour, and the flesh inside was bright white and flaky for a change. Given a choice between Gravy or Curry Sauce, there’s no contest – it’s always the latter – my chips swam in a salty sweet pool while the fish was presented to me like a trophy; proudly sat on top of ‘proper’ chips. Cutlery wrapped in a napkin; coffee delivered plate side at my table and all from a local chippy – I was beyond impressed, though from the reserve on my face, she’d never tell. Only thing is, I wish the white cup had been a better washed one as it was hard to tell the last clean bit of porcelain I’d perched my lips on. Unless they spilt the coffee a bit when stirring, but for £3.50 and while in a strange part of Manchester, this usually particular lady was not going to ask for a new one. Thank you lol wish I’d have taken a photo of my actual photo but hey, technology’s fault. I had a look at your blog but I need some time to scour through while on my laptop as I can’t do it on the go with my phone at the moment. Nicely written, concise with decent imagery! I love reading pieces that poetic punch! Thank you very much Elliot! When are you going to start doing some blogging so I can read yours?! You are welcome 🙂 I write songs that is my way of blogging or my facebook or twitter posts!!! !